Scientists have developed an ultra-light limb that they claim can mimic the movement in a real hand better than any currently available. At present, prosthetic hands either do not move at all or have a simple single-motor grip. But the University of Southampton team has designed a prototype that uses six sets of motors and gears so each of the five fingers can move independently. Details of their design were presented at an Institute of Physics conference. Every year 200 people in the UK lose their hands. Common causes include motorbike accidents and industrial incidents. It is hard for scientists to replicate hand movement, as the real thing has 27 bones and can make a huge number of complex movements and actions. 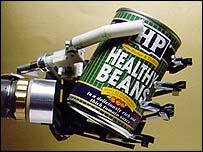 The Southampton team believe their prototype is able to make movements and grip objects in the same way that a real hand does. The new hand - called the Southampton Remedi-Hand - can be connected to muscles in the arm via a small processing unit and is controlled by small contractions of the muscles which move the wrist. Researcher Dr Paul Chappell, a medical physicist who worked on the device, said: "With this hand you can clutch objects such as a ball, you can move the thumb out to one side and grip objects with the index finger in the way you do when opening a lock with a key, and you can wrap your fingers around an object in what we call the power grip - like the one you use when you hold a hammer or a microphone." The latest design is also very light - at 400g it is lighter than the average human hand. Heavy prosthetics can be extremely uncomfortable and cause injury to the area where it joins with the arm. The hand was built in three parts - the three middle fingers are very similar in size and movement so those were made identical. The little finger is a smaller version of the same. Each of these four fingers are made up of a motor attached to a gearbox attached to a carbon fibre finger. All of this is fitted to a carbon fibre palm. But the thumb was much more complicated. The human thumb can move in special ways the fingers cannot. It can rotate as well as flex and also move in a variety of different directions. It can also oppose (touch) each of the fingers in the hand to form a 'pinch'. To mimic this, the Remedi-Hand uses two motors - one to allow it to rotate and one to allow it to flex. The researchers say it has the first artificially-made opposable thumb. Dr Chappell said: "The real thumb can move in five types of way, we've managed to create a thumb that can mimic at least two of these which is a really exciting achievement. "It's a thumb that has really good flexibility and functionality." The next stage will be to integrate the latest sensor technology to create a 'clever' hand which can sense how strongly it is gripping an object, or whether an object is slipping. Dr Chappell said: "The aim is to create a hand with the sort of functionality a human hand has but also a sense of touch." Jared O'Mara, of the British Council of Disabled People, welcomed the Southampton work. He said: "We are eager to see how such a device will work in practice and are hopeful that it will help many disabled people to lead easier lives, in particular during the course of day to day remedial tasks."